I love walking into my pantry and seeing the beautiful colors lined up screaming “pick me!”. From the green of green beans to the orange of pumpkin. Almost every veggie looks better dressed in glass. We do love our fresh summer picks. I think preserved food looks so good to us because we worked so hard nurturing it as a seedling to packing it into jars. It could be black and we’d still admire it. Okay, maybe not so much. Does anyone else love sauerkraut immensely? Why is it so stinking good?? Is it because it’s cabbage and cabbage is yummy? Or because it’s fermented and is so beneficial for our body? Or is it because it’s so simple to make?? All of the above! So when we were in Virginia over the weekend visiting my parents we went to the state line produce in Cana so I could snag some mountain cabbage. I’ve been wanting to make some sauerkraut for quite some time. I haven’t made any in almost 2 years. I always thought that pickling cabbage was sauerkraut. True sad story. Although the flavor might be similar the benefits are not. 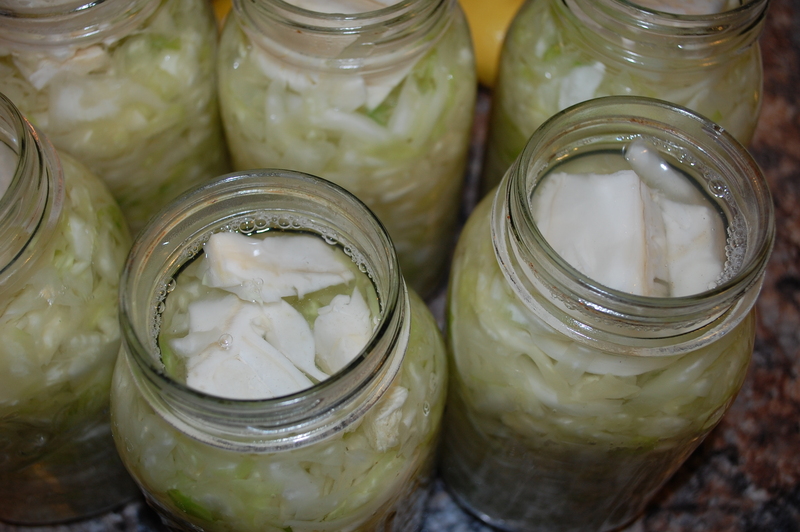 The benefits from fermented foods are incomparable to any other way of preserving. Pickling cabbage is a quick easy way to preserve the cabbage without waiting for it to ferment. 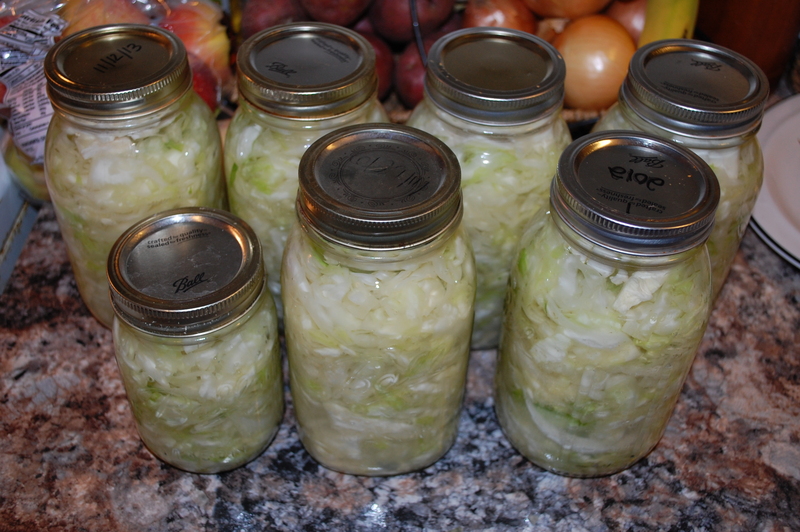 Once you put fermented food through a canning process the heat kills the good bacteria that it worked so hard togrow. But if you want to enjoy your kraut year around then you have to make it shelf stable. Although it won’t have the same benefits as kraut that hasn’t been canned it will still taste amazing. 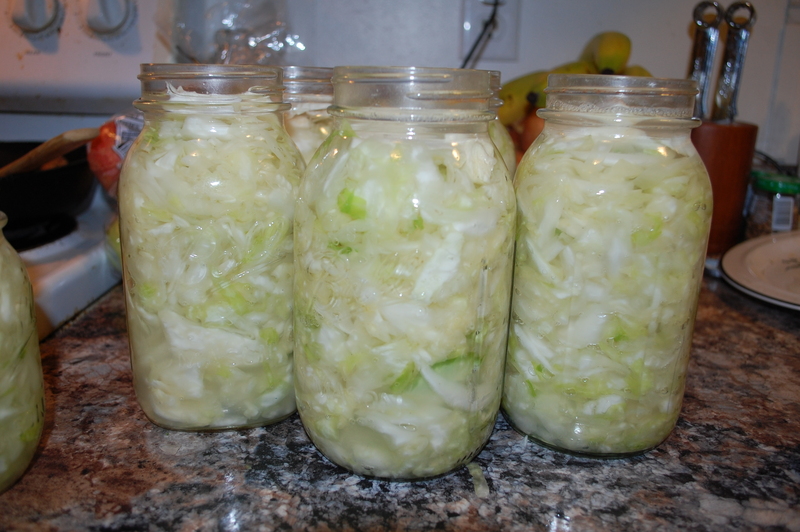 Two heads of mountain cabbage yielded 6 quarts and 1 pint of kraut. Mountain cabbage is bigger than what you tend to find in the grocery store. So if you’re using store-bought cabbage you can still use this recipe. You may not have as many quarts in the end as I did. 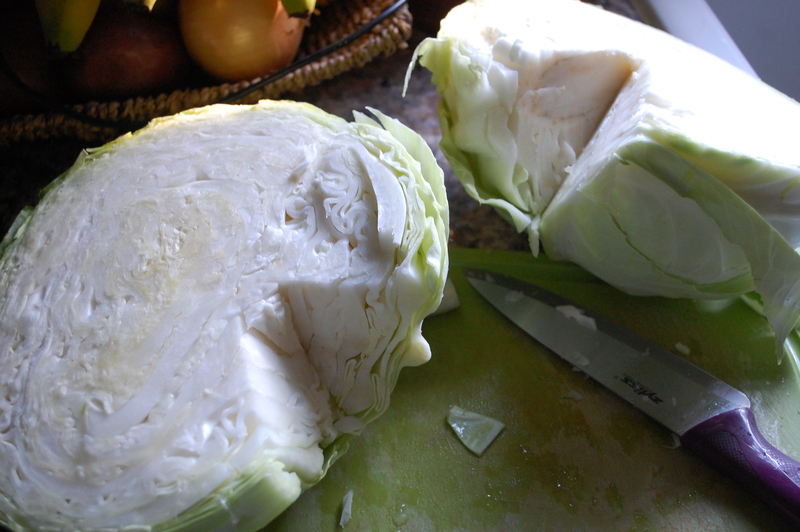 • I first quartered the cabbage and removed the core – setting the core aside for later. 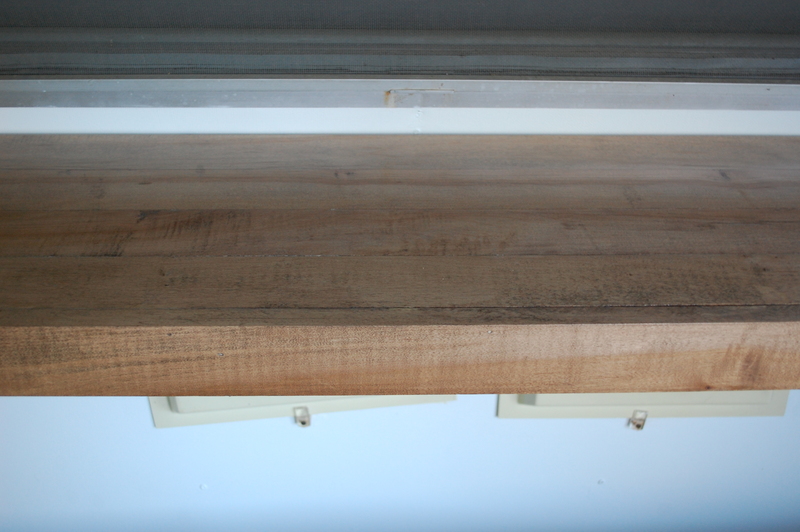 I then chopped them as even as possible about 1/4″ in width cutting long ways (I don’t think it matters which direction you chop them). 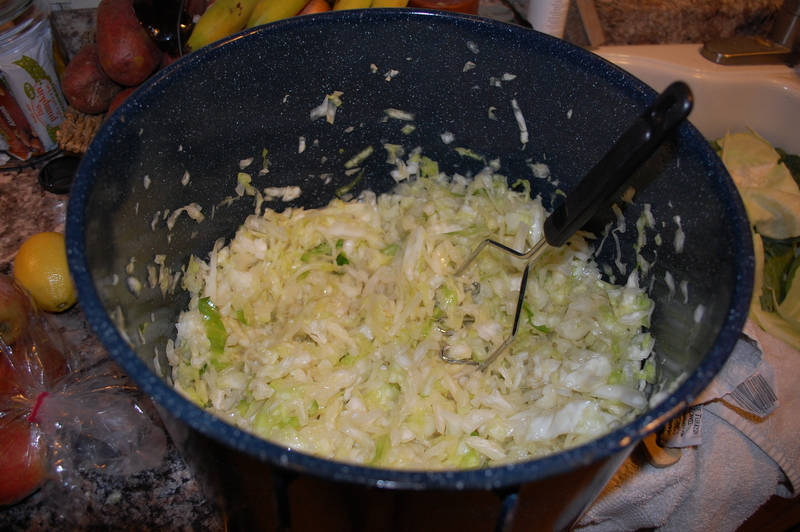 • I don’t have a stone crock so I used my water bath canner because that’s all I had that would hold all of the cabbage. I put the first chopped cabbage into the bottom then sprinkled 1.5 Tablespoons sea salt over it. Then I repeated that step with the second head. So it was cabbage, sea salt, cabbage, sea salt. Let it rest for 10 minutes. • I worked it for about 20 minutes until the cabbage was about half the size it was in the bowl and it was kind of translucent. 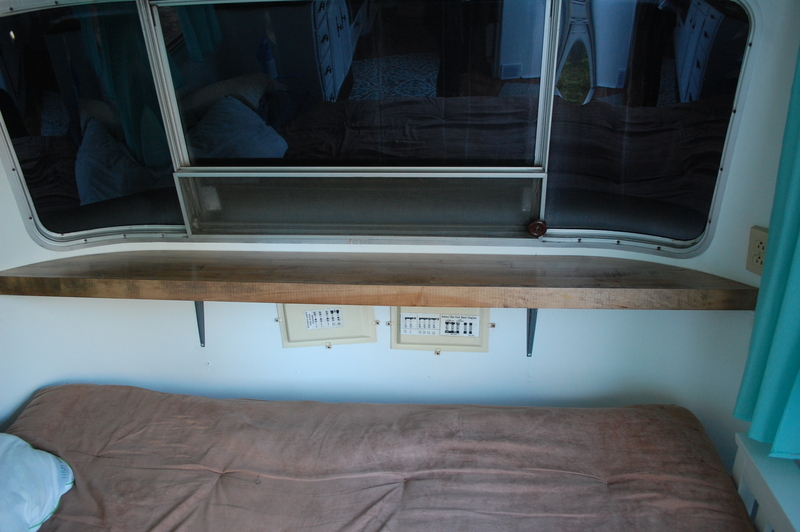 • Now you’re ready for your jars. I started transferring my now wet cabbage into their new homes… packing them down after every spoonful. • Once I had the cabbage in the jars I poured what solution that was left in the bowl over the cabbage. I didn’t have enough to cover all of the cabbage so I made a brine to finish off the rest of the jars. I brought 4 cups of water to a boil and dissolved 1 tablespoon of sea salt. Once it was dissolved I poured it over the cabbage. Then used the end of my spoon to get the air bubbles out. We’re getting close. • So we want the cabbage to stay under the brine so remember the core we set aside? Put that on top and push it down submerging the cabbage. Don’t worry if the core isn’t you probably will toss it anyways. • Tighten your lids to the jar loosely and set them on a plate or in a pan for they may “juice” which is totally normal. You may want to burp the jars by unscrewing them in a day or so. Let them sit for at least 1 week to ferment then enjoy! The longer they ferment the tangier they will be. After you’re satisfied with the ferment time then scoop off any “scum” and toss the cabbage cores and can if you wish. 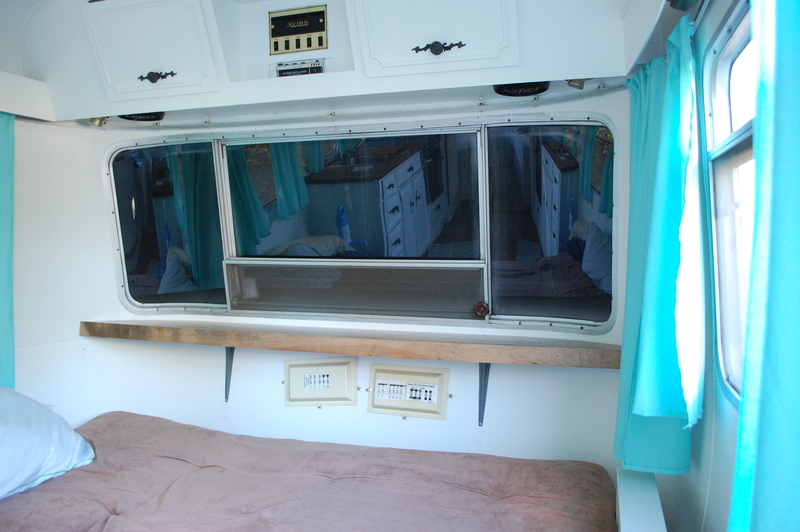 Happy fermenting and happy camping! Great idea for using the cabbage core! I just made my first batch of sauerkraut using this method. It tastes correct but the cabbage is really soft and has no crunch. Any idea what I’m doing wrong? Oh no! Mine has a great crunch. Fermenting is best in cooler temperatures. So if it’s really warm in your house then it might throw the fermentation off. It’s recommended to ferment under 72 degrees. I hope this helps! OK thank you, this is useful! It isn’t as enjoyable when there’s no real crunch or texture left! I thought it might be because I added too much brine? It’s been fermented at about 18 degrees C (65 farenheit) so I don’t think it can be that. Perhaps it’s the quality of the cabbage? I got some cheap in the market. Oh then that couldn’t be it. I guess it could be. Did you use sea salt? Yup, sea salt all the way. I’m really all out of ideas unless there’s such a thing as beating the crunch out of it lol. Do you think you worked it too long? 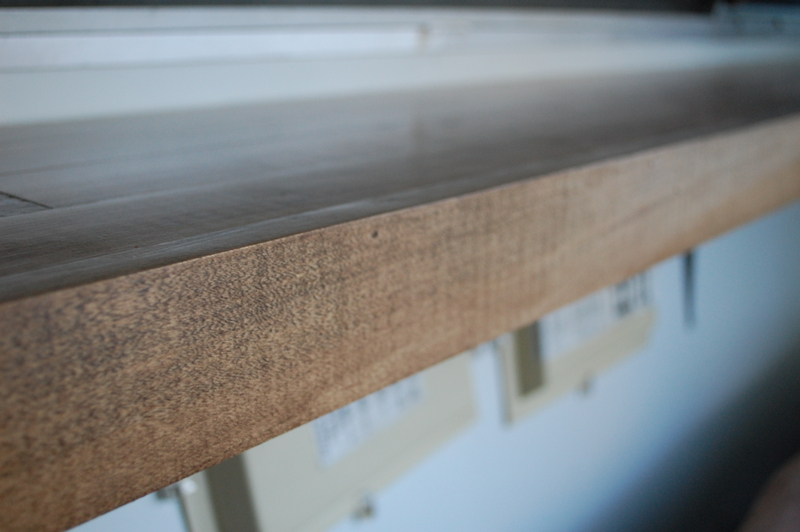 Like beyond translucency? Maybe next time don’t work it as long. Hopefully that would help the cabbage stay crunchy. Hahaha! No I don’t think I beat it out although the idea of it makes me chuckle. I got tired quickly and so did the minimal amount of beating out of laziness. Maybe that’s it? Not enough pummelling, followed by too much brine? It is pretty comical 🙂 maybe so. I worked mine until it was translucent and it came out with a great crunch. So maybe you’re onto something there? Btw I love your blog! I have about five heads of cabbage in the garden. I think some of it will turn into kraut! I think you should 🙂 it’s so tasty! My next project will be kimchi. My husband loves it so I’d like to make it for him. We can’t find it in any store here. I hope it works well for you! What’s the difference between kimchi and sauerkraut? Kraut is typically just fermented green cabbage whereas kimchi is made from Napa cabbage, other vegetables, fish sauce and spices. 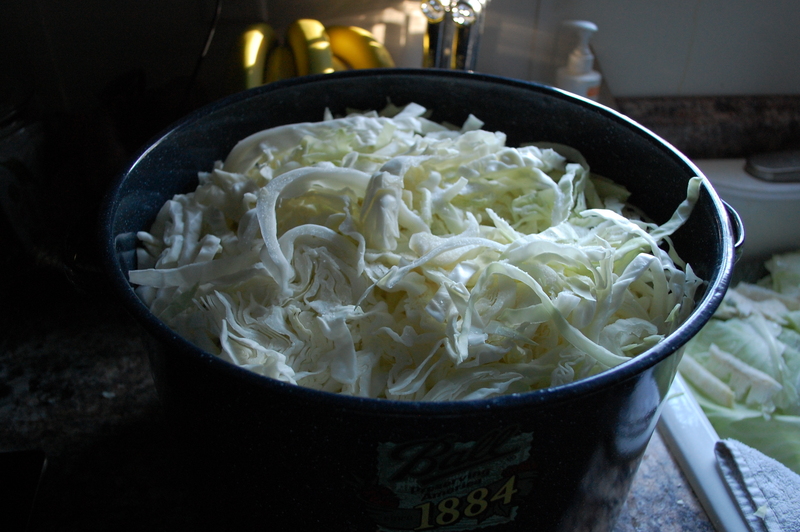 Thank you – I’m always interested in varieties of methods for making kraut! Idk if this is the BEST way but it works! Wish I had a stone crock! That would be ideal! Glad you enjoyed it!